Currently listening to the Native America Calling radio episode (program? I'm more familiar with podcasts) about the book. The author did a really beautiful reading that was so touching and wonderful. Another book to recommend to my local library. Today at Fairview's No. 3 Annex, where my wife Lucille serves as Principal and I as children's literature instructor, 2018 Caldecott contender Frane Lessac (a favorite son who grew up in bordering Cliffside and graduated CPHS the same year as I did in 1972) and her husband author Mark Greenwood, collaborated on a spectacular smart board and drawing presentation that had First and Second grade students enthralled. 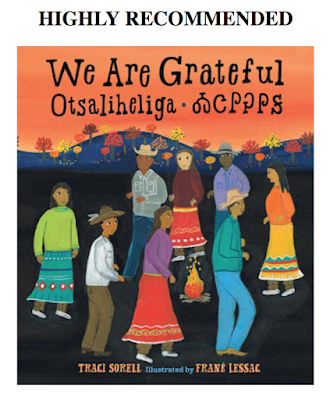 We are all so honored that Frane, one of the most popular and accomplished students in high school, is a major contender this year for the Caldecott Medal for her ravishing art in "We Are Grafeful: Otsaliheliga" authored by Traci Sorell. We will be meeting Ms. Sorell tomorrow at the Warwick Book Festival, and I do look forward to speaking with her. This was an amazing debut for her and Lessac's vivid art brought these ravishing location to soulful realization. The first-graders in my school, largely Hispanic Americans were/are fascinated confirming what author Joseph Bruchac stated in his dust jacket recommendation. Excellent capsule review and recommendation here!